Song writing is a wonderfully rewarding thing to spend your time on, and you’re well on the way to writing some music that you are truly proud of. I’ve got some great information to share with you that will put you well on your way to becoming a songwriter that is constantly writing compelling, wonderful pieces of music. Let me tell you just a few things you’re going to learn in this 6 part series. Firstly, You will learn the key to greatly accelerating your development as a songwriter, whether you’re just starting out, been writing songs for some time, or are a seasoned professional.I’m not exaggerating when I say that some of what you’re about to learn will skyrocket you past the great majority of songwriters very quickly. You will also learn the number 1 mistake that 99% of songwriters make over and over again, that holds them back from reaching their full potential. You’ll be surprised to learn the answer to this, and how easy it is to avoid this common mistake that is so damaging. As well, you’ll learn all about an overlooked topic that is actually crucial to creating music with a touch of magic that causes your listeners to be moved, and feel tingles run down their back. And many more interesting things that will really help you grasp how to write songs many levels above what you’re currently creating. There are some people in this world who seem to have magical song writing and composing abilities. The pieces they write are so good that it seems to defy logic that one person could accomplish something so amazing. On the other hand, there are people who struggle with song writing, sweat it out for hours without creating anything near inspiring, and usually end up giving up in frustration. Why is it that some people can write stunning blockbusters, while others fail miserably? That’s what we’re going to talk about in this series. 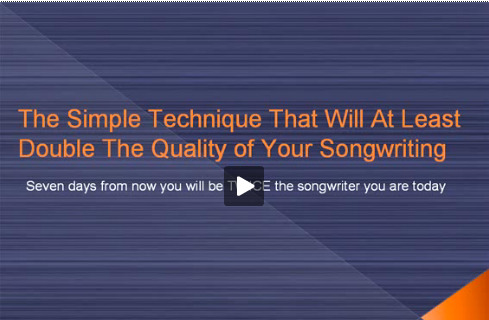 Let’s begin by taking a look at one of the more "overlooked" topics about song writing. While "overlooked" though, this topic is actually one of the keys to mastering the art of songwriting. Well, if you do a quick search at amazon.com or in google, you'll find that there is a truckload of information out there on the "mechanics" of what a good song is composed of. You'll find that there is information on how to write hooks, choruses, verses, chord progressions and more. While this information does have it's place, and later I will show you some specifics to help you understand these things, they’re pointless without an understanding in the topic I'm about to discuss. So what is this topic and why is it so important? If you understand the state of mind that produces the most compelling song writing, everything else you know about songwriting comes to life. Everything flows easier. Great ideas are easier to come by, and writing music and lyrics becomes a joyful, easy process. If you don't know what this "optimal song writing state" is though, you will struggle. You may know everything there is to know about music, yet if you are unable to get into this state you will fall well short of your full potential. On the other hand, once you’ve learned this important concept, even if you’re a newbie songwriter you will be able to compose excellent music. There is a very interesting quote said by Robert Dilts in his fine book “Strategies of Genius” . This quote was said in regards to the great composer Mozart and the way this "musical genius" composed music. In my experience of experimenting with songwriting techniques over the last 5 years, this quote is spot on. The easiest way to "free the master songwriter" that is within you, is to discover how to set up the physical and mental conditions that will allow your best ideas to come forward. Now that may sound like a mouthful at this stage, but I assure you, by the end of this series you will know exactly what this means, and how you can easily integrate it into your song writing process. And when it “clicks” for you, you can begin writing songs using the same methods that the “musical geniuses” of the world use. Mozart… Beethoven… Paul McCartney… and every other great songwriter/composer, uses the methods that you are about to learn about in this series. With that said, let's begin digging deeper into what the best psychological state is to create music from. I'd like to share with you a very elegant concept that I learned from Timothy Gallwey in his "Inner Game" series of books. This concept describes in a very simple way the two main processes that go on inside your mind and body while you create music and lyrics. Inside your head you may notice from time to time that there is a voice that talks. This is sometimes known as your inner dialogue, or your "self talk". This talking that goes on inside your head is "self one", while the person being spoken to is self two. Firstly, think of a time when you performed particularly well at some task. It can be anything… a sports game you played in, a musical performance, cooking a great meal, or even just having an amazing conversation with a loved one. Now, can you tell me exactly what you were thinking as you did this great performance? Here's what I'm guessing. You probably can't remember too much about what was going through your mind as you performed at your peak. You were very likely in a "zone" where you automatically and instinctively acted, without too much noticeable thought at all. The point is: Self one is the part of you that interferes and hinders your results. When you loose track of self one, you are able to sink into self two, which is when "peak performance" will occur. Self two is where your full potential lies. Self two contains all of your unconscious resources… which are far richer than anything self one could ever muster. Scientists predict that in one human brain, there is enough processing power to hold many times the knowledge of the largest library in the world. Most of this information though, is offline, so you are not always aware that you have this knowledge. This gives you an idea of the great things you can accomplish in your song writing if you can learn to release self two, who is the master songwriter that exists within you. It means that to create music at your full potential, you need to find a way to let self two "take over" while completely ignoring self one. So to perform at your full potential… and in the case of song writing… to write the best possible songs you can write, you need to learn how to cancel the effects of self one, which will eliminate interference. In the next part we will take a look at what is happening inside your mind and body when self two has taken over, and you are at "peak performance".